Lupita Nyong'o will be hitting the promo trail soon to promote the new 'Black Panther' movie and I can't wait. Last night(January 9th) she attended the 2018 National Board of Review Annual Awards Gala at Cipriani 42nd Street in New York. 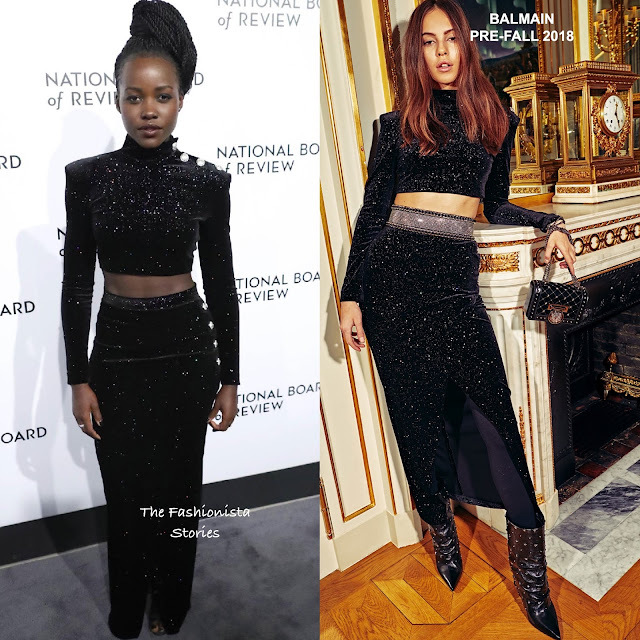 Showing off her toned midriff, she wore the BALMAIN PRE-FALL 2018 black & silver Star speckled crop top with padded shoulders and the matching side button, illusion wrap style skirt. In the look book, the skirt was shown with a chain embellished belt which she left out. I actually like the skirt with the belt but Lupita nailed this look from head to toe. DANA REBECCA DESIGNS jewelry and JIMMY CHOO sandals finished up her sultry look.